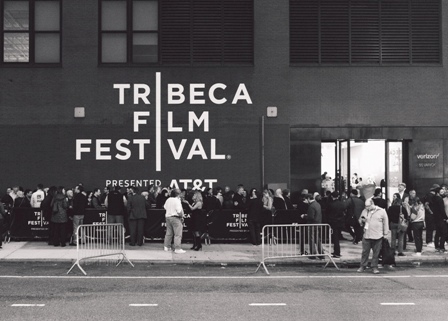 Tribeca Film Festival announced that in 2019 the three competition sections consist of 50% women directed films, 40% of the feature films have one or more women directors, and female filmmakers directed 45% of the shorts selections, though the Festival encompasses a myriad of categories and special screenings. “Films” now extend beyond the theatrical screen to varying lengths and intended distribution, including streaming platforms, television (pilots, “episodic” or “short form”), interactive virtual reality, and more. By my count of what work women filmmakers were in control as creative artists, the Festival altogether presents 45 features; 32 short films; 12 in the various immersive storytelling projects; six television projects; 11 N.O.W. (New Online Work); two finalists for the X Award that use storytelling to combine advertising and entertainment. Many were World, International, U.S., or New York premieres, with their makers attending at Manhattan theaters from April 24 to May 5, 2019 for the 18th annual showcase. The anticipated centerpiece of the Festival each year for me is the Nora Ephron Award. The guidelines this year are that the award will go to: “One narrative film directed by or written by a woman making its World or International Premiere will receive the Nora Ephron Award, which recognizes a woman who embodies the spirit and vision of the legendary filmmaker and writer Nora Ephron.” As in previous years, the Festival Press Office would not commit to identifying the award-eligible films in advance. I presumed 15 possibly eligible films, in competition and non-competition categories. I also continue to be the only film critic to follow previous Ephron Award winners. The jurors for the 2019 Nora Ephron Award are: Debra Messing, actress/activist; Chloë Sevigny, actress/director; and DeWanda Wise, actress/producer. My commentary on the Ephron Award, 2019 and past, will be posted at FF2 Media. I also spotlight what I call “Women Crew-Ed Films” (just don’t say it out-loud), the work of women collaborators in the Festival’s feature and short films, television offerings, N.O.W. (New Online Work) shorts for online platforms and “immersive” virtual reality projects (though I’m not sure of those nomenclatures-in-charge) – writers, cinematographers, editors, and composers. Some of these artists may be future directors, but all are in the pool for future work-to-watch. This report is, therefore, the most complete overview with commentary of all the work by women credited at the 2019 Tribeca Film Festival. (Even I won’t get to see all of them, including weeks of follow-up trying, and I give up waiting for all the V.R. and games.) But let me know if I’ve accidentally excluded any work! Many of the films not already picked up for commercial theatrical or network/platform distribution continue on the festival circuit around the U.S. and world, particularly the shorts. So you will still have opportunities to see these women filmmakers’ work that I will recommend. The TFI Sloan Filmmaker Fund 2019 grantees did not include any women directors, unlike past years. I am particularly looking forward to seeing in the near future Jessica Oreck’s One Man Dies a Million Times, which, oddly, is premiering at other film festivals this spring. My commentary on the Jewish women. My review after Festival premiere on 4/28 1:30pm. Cohen Media Group will distribute in U.S.
IFC Films will release theatrically on May 10 with national-roll out to follow. HBO broadcast will premiere May 3. Sundance Selects releases in select U.S. theaters and VOD on June 7. Universal Pictures will do international distribution. Is this assured showing on ESPN in their 30-by-30 doc series? My review after Festival premiere on 4/27 8:30pm. After the Premiere screening: A master class conversation with sound designers and editors from the film includes sound editor Midge Costin, Kay Rose Professor in the Art of Dialogue & Sound Editing at USC Cinematic Arts. The World Premiere was held last month at Doc Fortnight: The Museum of Modern Art’s International Festival of Nonfiction Film and Media (photo above). 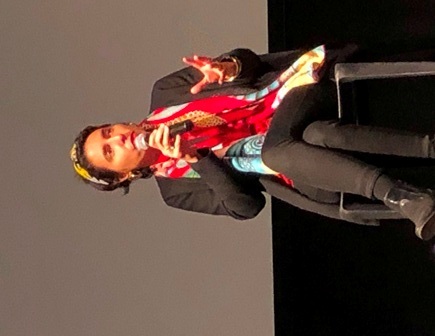 After the Screening: A conversation with Director/Artist Prune Nourry and Columbia University Professor and author Rita Charon. Followed by “drinks and bites inspired by Nourry’s work”. My review after Festival premiere on 4/26 5:45pm. Third (1820s) episode in the series The History of White People in America - 16 animated, musical shorts on race in America from the 17th century to the 21st. With ITVS support, the first three episodes will be available online Summer 2019 on PBS’s Independent Lens. Is this assured showing on ESPN? Usually, the women directors in their 30-by-30 doc series are only of such shorts. After the Screening: The conversation will include showrunner Kelly Souders, executive producer Lynda Obst, and cast member Julianna Margulies. National Geographic Channel will premiere on May 27, over three nights. This is a re-adaptation of Richard Preston’s The Hot Zone: The Terrifying True Story of the Origins of the Ebola Virus (1994), whose research was supported by a grant by the Alfred P. Sloan Foundation, a TFF sponsor. Netflix will premiere on May 3. Starz will premiere Season 2 of Vida on May 23, when the entire season will be available for bingeing on the app, and presumably On Demand. My review after Festival premiere on 4/26 6:45pm. A24 will release in theaters. Neon will release in theaters. My review near Festival premiere on 4/28 7:30pm. My review after Festival premiere on 4/27 2pm. Neon will release in theaters June 14. My review closer to Festival premiere on 5/1 8:30pm. After the Premiere Screening: A conversation with subject Dr. Ruth Westheimer will be moderated by Columbia University Film Professor Annette Insdorf. Magnolia Pictures will release in theaters May 3; Hulu will stream June 1. My review closer to the theatrical release. After the Premiere Screening: conversation with co-directors and producers Taryn Southern and Elena Gaby will include Duke University Professor of Law and Philosophy Nita Farahany. CNN Films will broadcast in 2019. Sony Pictures Classics releases in U.S. theaters June 28. Why isn’t this in Tribeca ESPN Sports Film Festival? My review near the Festival premiere on May 1. Sundance Selects releases in theaters June 21 and on VOD June 28. My review after Festival premiere on 5/2 9pm. My review after Festival premiere on 4/25 6:30pm. My commentary on 9/11 images. After the Premiere Screening: conversation will include producer Isabel Davis. Dust will distribute in U.S.
After the Premiere Screening: A comedy performance by the featured comedy troupe Asperger’s Are Us. HBO will broadcast six half-hour episodes of the docu-series April 30 to May 2. NB: I will update for film release for wider distribution or other viewing.